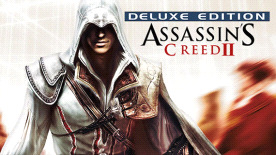 EZIO, A NEW ASSASSIN FOR A NEW ERA: Ezio Auditore da Firenze is a young Italian noble who will learn the ways of the assassins after his family was betrayed and he looks to seek vengeance. He is a lady’s man, a free soul with panache yet has a very human side to his personality. Through him, you become a master assassin. RENAISSANCE ITALY: Italy in the 15th century was less a country and more a collection of city-states where families with political and economic strength began to take leadership roles in cities like Florence and Venice. This journey through some of the most beautiful cities in the world takes place in a time in history where culture and art were born alongside some of the most chilling stories of corruption, greed and murder. A NEW-FOUND FREEDOM: You will be able to perform missions when you want and how you want in this open-ended world that brings back free-running and adds elements such as swimming and even flying to the adventure. The variety in gameplay adds another layer for you to truly play through the game any way you choose. DYNAMIC CROWD: Discover a living, breathing world where every character is an opportunity for the player. Blending in with the crowd is easier, working with in-game characters provide ample rewards but can also lead to surprising consequences. BECOME A MASTER ASSASSIN: Perfect your skills to become a master assassin where you brandish new weapons, learn to disarm enemies then use their weapons against them, and assassinate enemies using both hidden blades. This product does not support Windows® 98/ME/2000/NT. Supported Video/Graphics Cards at Time of Release: ATI RADEON X1950 / HD 2000 / HD 3000/ HD 4000/ HD 5000 series NVIDIA GeForce 7 / 8 / 9 / GT / GTS / GTX series Laptop versions of these cards may work but are NOT supported. These chipsets are the only ones that will run this game. For the mOperating Systemt up-to-date minimum requirement listings, please visit the FAQ for this game on our support website: http://support.ubi.com. Assassin’s Creed 2 © 2010 Ubisoft Entertainment. All Rights Reserved. Assassin’s Creed, Ubisoft and the Ubisoft logo are trademarks of Ubisoft Entertainment in the U.S. and/or other countries. Developed and published by Ubisoft.